CalWORKs recipients, unless exempt, are required to participate in welfare-to-work (WTW) program activities as a condition of receiving cash aid. A number of clients, however, may have issues that impede successful engagement in WTW program activities, such as substance abuse, mental health concerns, or domestic violence issues. 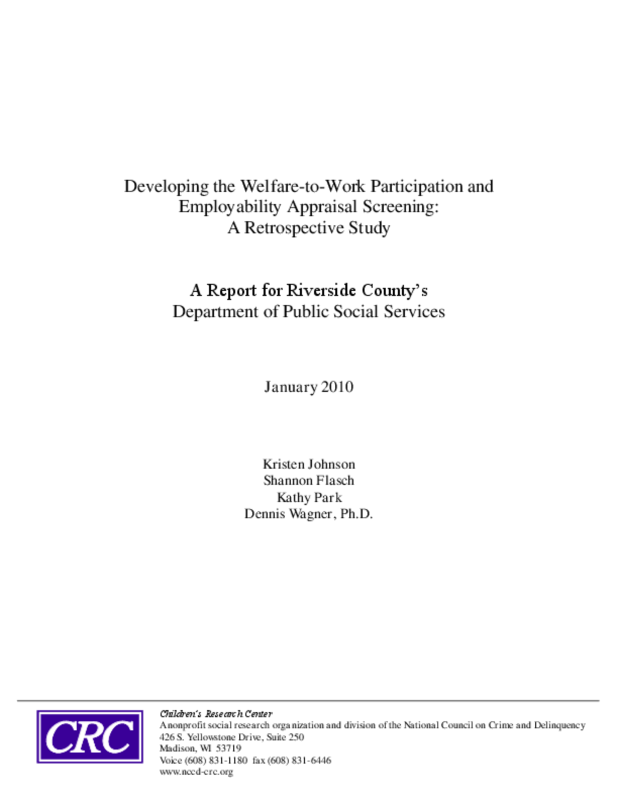 The Riverside County (California) Department of Mental Health (RCDMH) and the Department of Public Social Services (DPSS) sought to develop a structured case management system to help ensure early identification of WTW customers with barriers to employment and, if necessary, to help facilitate quicker engagement in services to address those barriers and move customers into successful employment. A key component of the structured case management system is an actuarial appraisal screening to help identify those customers most in need of support to make a successful transition to self-sufficiency. This report describes the study conducted by Childrenas Research Center (CRC) to develop an appraisal screening that classifies customers by the likelihood of subsequent WTW program participation and employment. Employment counselors can complete the screening assessment soon after WTW assignment to help identify which customers are in greatest need of additional support and engagement to increase the likelihood of successful program participation.